How do I use the real-time protection shields in Security Reviver? 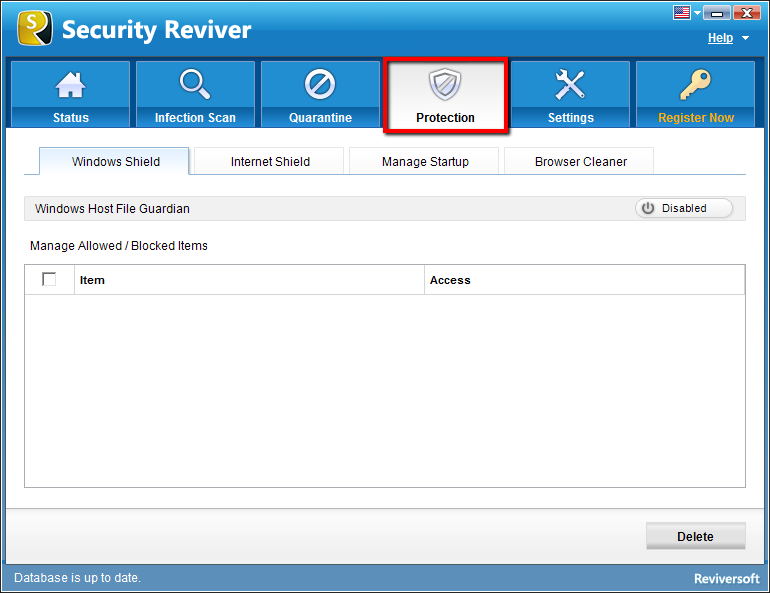 Security Reviver offers Real-Time (always on) Protection Shields for round the clock protection of your PC. •	Allow – Select the ‘Don’t ask me again’ option and then click on ‘Allow’ button if you trust the application/program and wish to execute the program on the system. All the sessions when you allowed the applications to run on the system will be listed under the “Windows Shield” tab. •	Block – Select the ‘Don’t ask me again’ option and then click on ‘Block’ button if you do not find the application authentic and do not wish it to run on the system. All the sessions when you blocked the application to execute on the system will be listed under the “Windows Shield” tab. •	Allow – Select the ‘Don’t ask me again’ option and then click on ‘Allow’ button if you trust the application/program and wish to execute the program on the system. All the sessions when you allowed the applications to run on the system will be listed under the “Internet Shield” tab. •	Block – Select the ‘Don’t ask me again’ option and then click on ‘Block’ button if you do not find the application authentic and do not wish it to run on the system. All the sessions when you blocked the application to execute on the system will be listed under the “Internet Shield” tab. Programs/applications, you allow or block will be listed here under their respective tabs. To remove unneeded events from the list, click on the “Delete” button. How do I cancel my subscription for Security Reviver? How do I reinstall Security Reviver on my PC? How do I upgrade to the latest version of Security Reviver? How do I access the Quarantine section of Security Reviver?